The BPM Festival ups the ante with the announcement of the Phase 2 artist lineup and showcases for its seventh edition in Playa Del Carmen, Riviera Maya, Mexico from January 3 to 12, 2014. 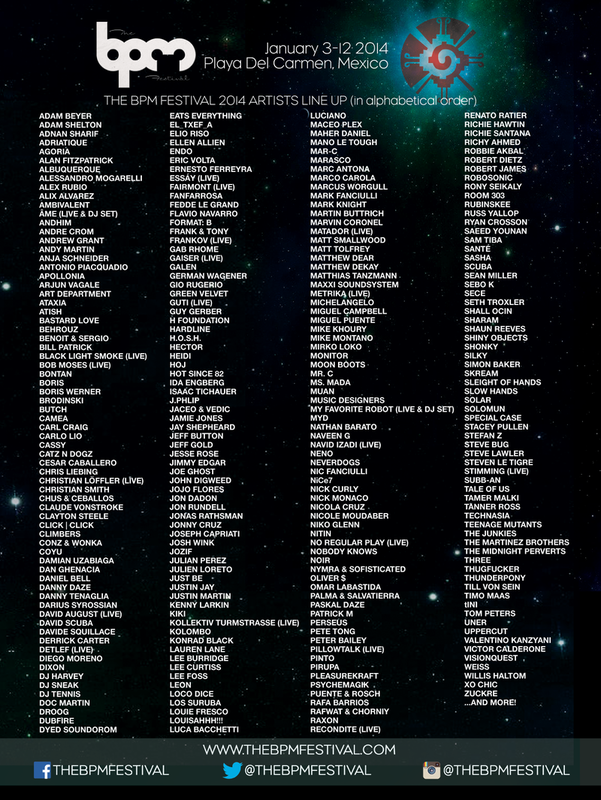 With over 250 artists confirmed, BPM 2014 continues to expand its musical scope, bringing the top talents from all around the world playing the highest quality electronic over ten days in one of the most spectacular winter hotspots on the planet. BPM is proud to announce the following showcase debuts: All Gone Pete Tong, Luca Bacchetti’s Endless, white hot U.S. label French Express, Scuba’s Hotflush Recordings, Nicole Moudaber’s MOOD Records, Denmark’s Noir Music, Josh Wink’s Ovum Recordings, Nick Curly presents Trust, and Toronto’s Union. In addition to the showcases already announced in Phase 1, there will be the return of the following BPM veterans: Akbal Music, Bedrock Records, Cadenza, Digital Delight, Kraftek, MEXA vs. Off Recordings, Paradise, Pets Recordings, Smoke N’ Mirrors, Superfreq, This & That, This Is The End, tINI & the gang, and Wolf + Lamb. For the first time ever, BPM will host two editions of select parties during the festival, including: Lee Burridge’s All Day I Dream (January 4 & 11), Circo Loco (January 6 Night & January 10 Day) and Marco Carola’s Music On (January 6 Day & January 11 Night), plus special editions of Richie Hawtin presents ENTER. (January 5 Day & Night). The BPM Festival is powered by Orbitz.com (via the BPM travel portal) to offer the absolute best prices for flights and hotels for traveling to Playa del Carmen, and will refund the difference for users who find a lower price. By booking through the festival, users can find the best, most direct flights available, see how far each hotel is from all the main festival venues, and utilize a travel portal help section that includes all the need-to-knows about traveling to Mexico. CONTESTS: The BPM Festival has teamed up with Condo Hotels Playa del Carmen and BPMFestivalCondos.com to give one winner and up to three guests a chance to win a 7-day stay in a luxury two-bedroom condo plus two 10-day festival passes; details to enter here. 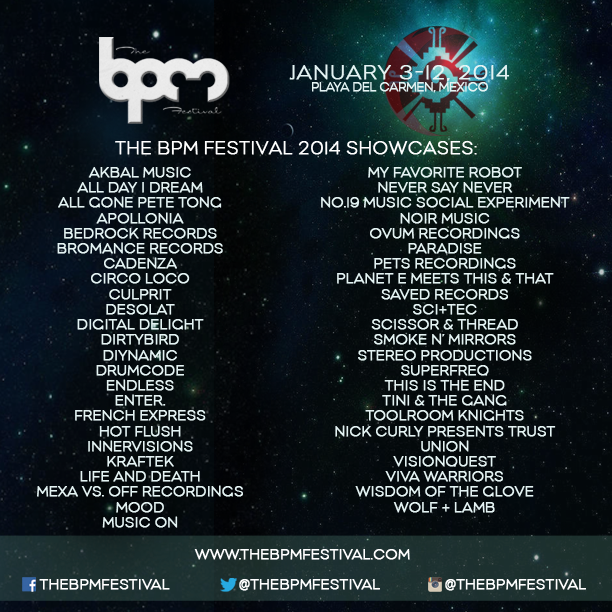 Also, book travel through the TheBPMFestival.com’s travel portal for a chance to win a pair of BPM wristbands! All events will be ticketed and entrance to all events is included with the purchase of 3-Day | 7-Day | 10-Day wristbands, now available at bpm.wantickets.com while supplies last. Wristbands include expedited, guaranteed entrance, and re-entry to all day & night parties. Single event tickets will be available at a later date (please note: single event tickets do not include re-entry).